1) Yes, Sadly, it is. 2) Horatio has a death wish. 3) Wiglaf should have fought harder to get Mordred in the back seat. Anyway – we haven’t had one in a while so! What’s your favorite way to keep yourself occupied on long car trips? Hehhe….99 bottles of beer on the wall…. haha! that’s what i do! but then i usually get hit. i also write signs that say “Honk if you feel sorry for me” or other such nonsense but that’s usually on a bus. I manly sleep to pass the time. Otherwise I read a book or play video games. Laptop + Power inverter (to charge laptop) + playstation emulator + yu gi oh forbidden memories. Demadaha, you had me until yu gi oh, but I won’t insult you for how you choose to waste your time. I read and listen to music on long car trips when I’m not required to act as the navigational device. On a long car drive… I’m the driver. -_-0 No games for me. But my iPod and me have loooooots of quality time together. Excellent work, Liliy, because the tension is palpable and the whole thing really does feel like a car interior. Tell me: Does Driver drive in England enough to have one of those massive, old, fold-out British driver’s licenses? Those are incredibly useful if you get pulled over in the US. Cops just don’t know what to do with them. On long car trips, I spend a great deal of time pondering (though people seem to think me stupid, if I’m asking a simple question, it’s because I’ve thought through all the variables [usually on a car trip] and there’s more to the issue) and listening to road noise (this can sound like music, both symphonies and rock concerts, and can change whether one actively listens or passively listens. If it’s a repetitive trip (road music never changes along a particular route, unless there is massive construction), I’ll turn on an audiobook. Yeah, you spelled it right. I usually sleep or listen to music. I would read, but I get carsick really really easily. I don’t like being carsick. I usually read, listen to my mp3 player, or write on my laptop (6 hr battery life, ftw). Okay, I’m finally sort of awake….a full honest answer from Shi-chan, then. So now I listen to music, sleep, or poke my sister. We once had a poke war that lasted a good two hours. I am exactly the same, sadly. If I try to read or play some hand-held game while in the car, I will get very queasy within a minute and have to stop. i usually sleep, draw, think of a story to write, or listen to my ipod. I stare out the window and daydream, mostly. When you’re a role player, imagining various scenarios involving your characters keeps you pretty entertained (especially when one is the Archangel of Death and can quite easily be caught at murder scenes every now and then). Though if the car ride is three hours long or more, I’ve found that I am very likely to sleep through most of it. Geez, I haven’t been on a “long” (1 hour+) trip in a couple of years! I suppose that I would bring my portable CD/DVD player and play/watch CDs/DVDs. last time i was in a car? I think either trying to have some time talking(or more!) with Van, and i played cards and laptops saves time! 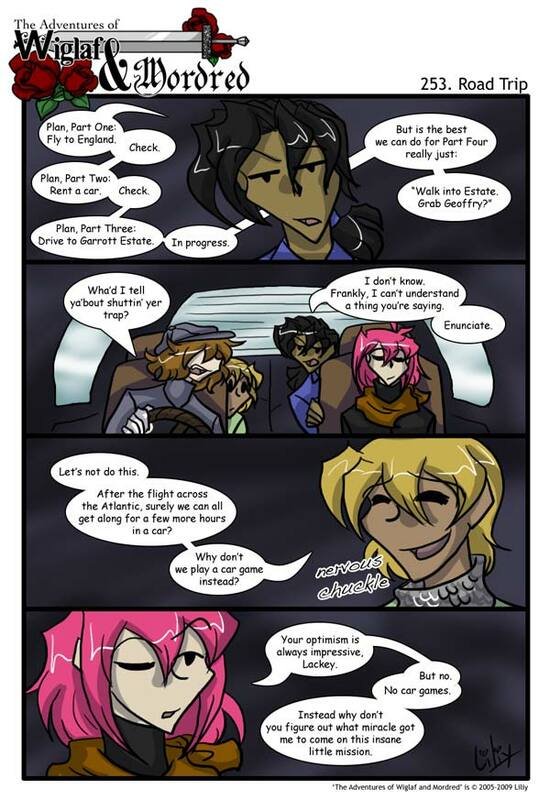 I like how you got Mordred look so very tired in the last panel. So did Mordred call “shotgun” or is that his seat by right? I usually drive so I listen to talk radio or my iPod.